Description: Adult male swallows have black plumage with glossy blue on the upperparts and black flight feathers. Their breast and belly are cream and they have a dark blue collar on the throat. They have a deeply forked black tail with long streamers. Swallows have an orange-red forehead and chin, a dark blue crown and nape and around the eyes is black. They have short, thin black bills, black eyes and black legs and feet. Female swallows are similar to the male but with shorter tail streamers and a less distinct collar on the throat. 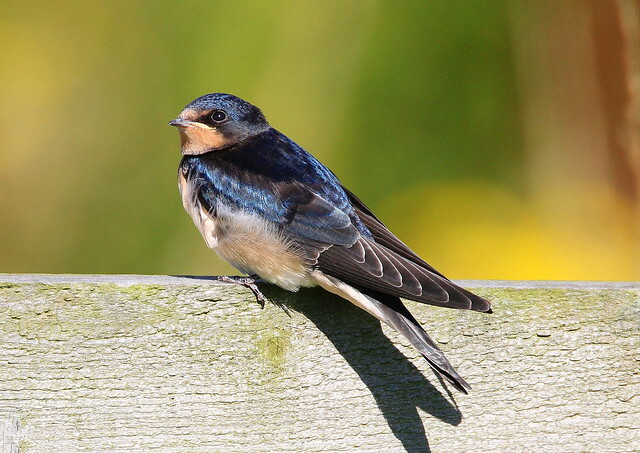 Juvenile swallows are duller than adults with a buff-white forehead and chin and they have short tail streamers. Nesting: Swallows nest on the ledges of buildings and cliff faces. Both male and female build a cup-shaped nest made from mud and dried grass. Swallows lay 4-5 white eggs which are speckled with brown. Females alone incubate the eggs for 14-16 days although if the female leaves the nest the male may incubate for 15 minutes at a time. However, if the female dies, the nest is abandoned. Chicks are fed insects by both parents and they fledge at 20-24 days. Feeding: Swallows feed and drink on the wing, catching insects including flies, grasshoppers, crickets, beetles, moths, butterflies and dragonflies. Where to see them: Swallows arrive in the UK in March and have departed by October. They can see across the UK in areas where there is a good supply of insects such as near open water, farmland. Before migrating they can often be found near reed beds.